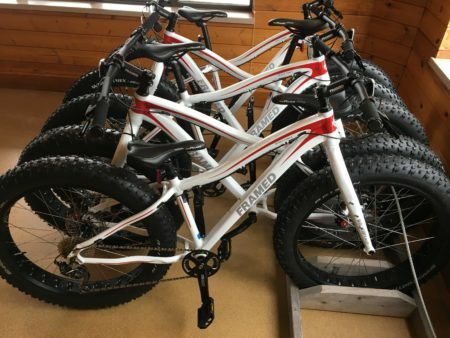 Spring/Summer/Fall~ Fat Bikes are available to rent at the Adventure Park Base Camp, located on the north end of the Upper lot at the Reforestation Camp. 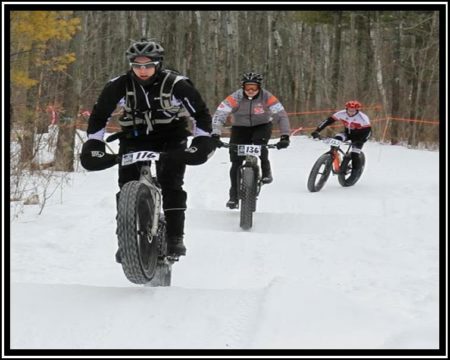 Winter~ Fat Bikes are available to rent at the Ski Lodge, located adjacent to the upper lot at the Reforestation Camp. 4378 Reforestation Rd. Green Bay WI 54313 (South of the NEW Zoo). Bikes are available on a “first come, first serve” basis. We have 10 bikes. We provide helmets with each bike rental. Dress as if you are going skiing, snowshoeing, or participating at the Adventure park. Bring water! (or purchase at ski lodge/Adventure Park) there are water bottle holders on most bikes at this time. During the Spring/Summer/Fall months, there are designated bike trails onsite ranging from 2.5 to 10.5 miles. This includes double track and single track. Maps of all trails will be provided with the bike rental at the Adventure Park. *when trails are open Fat bike rentals are available on weekends “first come, first serve” when trails are open. Last rental is 3:30pm. Groups or individuals can rent fat bikes during the week with reservation only on, Mondays, Wednesdays, & Fridays 12pm-4pm. Contact the Adventure Park Supervisor to check availability.